In The Legend of Zelda: Breath of the Wild, have to cope with challenges and lurks many dangers. Here you must not forget to check your heart meter from time to time. The more you fill your heart is the better. Link fills his heart when he takes food, which he initially has to cook. If you wish to cook in The Legend of Zelda: Breath of the Wild, then of course you need ingredients! You'll find them when you collect the appropriate plants or kill animals. At fireplace you can mix all the ingredients and prepare delicious food. The cocking system in TLOZ: Breath of the Wild is very complex and there is more to it than you might think at first. 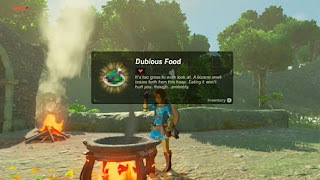 So the food is not only replenished your life energy, but also with advanced recipes you can get even more bonuses to attributes and reach new areas at certain points in the game world. Some food gives you a Stamina Boost, which gives you more time to climb higher cliffs or you get a cold protection, with which you can proceed further in frosty areas. Unlike the previous Zelda installments where you had access to new areas only by certain tools, here you can proceed further by cooking. If you play one or the other part of the Monster Hunter series, then you will get used to this system quickly. - Throughout the game world of Breath of the Wild you’ll find its plants, fruits, mushrooms, meat from hunted animals, etc. Take everything, so they end up in your bag. - You can take up to five ingredients simultaneously in the inventory. - Look for a matching hearth and then put all the ingredients in the saucepan. Now all 5 ingredients are mixed to form a new, tasty food. - Simple food you can produce up to a certain point without pot, but always require a hearth for cooking better recipes. - In fact, you have even the possibility to put a field on fire and then throwing the meat there. However, the result is not very exciting as with an ordinary cooking process. - Cooking operations may also fail and result in an unpalatable dish. Pay attention to the harmonious combination of ingredients. Meat and mushrooms as always give you a delicious dish. - You can also eat raw food, single ingredient, but this brings logically weaker results than through a cooking process. To establish the real good recipes, you need rare ingredients and spices. Truffle is as such ingredient. But it is not very effective alone, in mixing with other ingredients as Refining spice you get valuable additional bonuses. The truffle will temporarily increases your Health by an additional yellow heart. This is extremely handy when you stand around in front of a boss fight. - Cool is that you can not only produces food in some combinations of ingredients, but also elixirs and potions. - Another bonus by food is increased speed. You can run and climb cliffs faster. - The cooking system is based on a lot of trial and error. So try to combine different ingredients and discover new results.